There is a growing skills shortage in the engineering sector across the UK. As per an article published by The Engineer there is a need of non-EU, migrant engineers to prefer to reach the UK on Tier 2 visas. The UK today has an acute shortage of domestic labor. There is a requirement of Around 20,000 engineers, and it is heavily relying on foreigners to fill the gap. An Employer who intends to employ nationals of non-EU nations on Tier 2 Visas needs to first apply seeking a Tier 2 Sponsorship License. This is a tough process and at times there is a Home Office visit to the employer’s office, making things difficult. Owing to the tier 2 restricted CoS quota, there are insufficient visas to give employment to applicants on tier 2 visa hailing from outside the UK. Presently an employer has to pay annually £50,000 or upwards. Britain is facing an exit from the EU and there are apprehensions that the shortage in skills will intensify. Statistics of Engineering UK show that the shortage of Engineers is likely to exceed 180,000 every year until 2020. This is owing to the concerns among migrants regarding changes to UK immigration policies. They prefer to find employment in other places. Furthermore because of this shortage, many Engineering professions in the Electrical, Mechanical, Civil and Process Engineering spheres were added to Shortage Occupation List of the UK. The UK Shortage Occupation List is prepared by the government and has every skilled profession in Britain, where workers from the domestic labor pool in British or European Economic Area are not available. 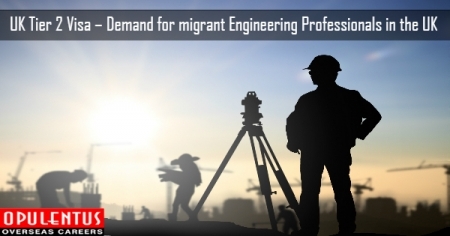 The Shortage Occupation List enables migrant engineers to apply for specific engineering roles. To gain eligibility to work in the UK, citizens of non-EU nations need a Tier 2 Skilled Worker Visa. The Tier 2 visa application process is subject to the Resident Labor Market Test. Before offering a post to a non-EU national, an employer has to advertise the vacancy for 28 days to targeted local and E.E.A. skilled workers. When a job role exists on the List of Shortage Occupation, R.L.M.T. does not apply. A non-EU migrant engineering professional, can submit the Tier 2 visa application which goes through the process immediately. The visa guidelines of Tier 2 (General), ask the applicants to meet certain criteria to seek approval of the application. A Tier 2 skilled worker visa has three years validity. There is another feature here. When a person applies for the visa to fill a vacancy existing in the Shortage Occupation List there is a discounted application fee. The Tier 2 visa has a provision in which there will be an extension to five years. The condition is that the holder must continue to work for the same firm. As per the Freedom of Movement Policy of the European Union, a Swiss or E.E.A. citizen with suitable qualifications and experience also can be employed as an engineer in Britain. He/she gets an exemption from applying for a UK visa. Moreover, there will be some changes subsequent to Britain’s exit from the EU. European nationals who presently work in the UK as engineers, or who intend to work in the future, should secure their place by applying for the E.E.A. Residence Card. It enables EU workers to prefer several employers, and submit new job applications. Finally they have to provide proof of residence in Britain.